Candlelight Records has set a June 25 North American release date for "Unnatural Selection", the new album from Denver thrashers Havok. The ten-song Cd was produced by David Sanchez, with mixing handled by Terry Date (Pantera, Overkill, Deftones). It features original artwork from Polish illustrator Rafal Wechterowicz (Slayer, Mastodon) and was mastered by James Murphy (Aborted, World Under Blood, Abigail Williams). "Give Me Libertyâ€¦ Or Give Me Death", the first single from "Unnatural Selection", will hit Loud Rock/Metal radio on May 27. The topical song is a furious and urgent anthem that displays the band's classic thrash and old school metal sound. Vocalist/guitarist David Sanchez ignites the fret board and barks the righteous lyrics while drummer Pete Webber punishes his immense kit. The song's towering sound benefits from the unique acoustics of the old theater that was utilized as one of the many recording locations for the album. "I am super pumped on how the drums came out," chimes Webber. "We recorded the drums in a theater to get a huge sound. It was a challenging experience for me between time constraints and the drum parts having much more feeling in them. I believe the added pressure made for some really awesome stuff. I can't wait to unleash this album to the world." "Unnatural Selection" is a far more mature collection of songs when compared to "Burn" (2009), and "Time Is Up" (2011). 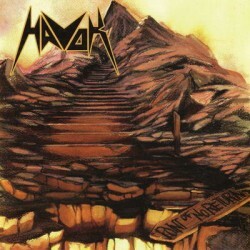 Havok has truly hit their mark with a sound that will please fans new and old. Additional album stand outs include album opener "I Am The State", "Chasing The Edge", and the band's rendition of the Black Sabbath classic "Children Of The Grave". Havok will premiere material from "Unnatural Selection" tonight when they take the stage for the start of their European tour with Suffocation and Cephalic Carnage. The 28-city tour begins in Geneve, Switzerland and will conclude in Munich, Germany on June 8. Before departing for Europe, the band performed at a Denver benefit. Sanchez comments, "We were honored to be part of HaneyStock. The show was a benefit for Chris Haney, who was a bartender at the Gothic Theatre in our hometown who was senselessly murdered trying to break up a fight. All proceeds from the show are going to his young daughter. It was a great event that celebrated the life of an outstanding individual." Havok has planned three special record-release performances. A copy of "Unnatural Selection" will be included with ticket purchase to these area performances. Havok is planning a full North American tour for early summer. Details will be announced shortly. Havok is guitarist/vocalist Dave Sanchez, bassist Mike Leon, guitarist Reece Scruggs, and drummer Pete Webber.